What veganism means to me. A friendly follower on Tumblr inquired about why I went vegan so I put together a wee video response. If you don’t follow me on Tumblr, it’s similar to Instagram except the sharing capabilities are better. You also have the ability to ask questions publicly or anonymously. As I mentioned in my previous post about why I went vegan, reading Fast Food Nation by Eric Schlosser opened my eyes to the horrors of the fast food industry. I first cut out meat for a few months and then went fully vegan by January of 2008. It’s been a long journey of gradually improving my diet from that point to where I am today. I’m so glad I took that first step to go vegan back in 2008. Now that I’m a raw vegan fruitarian, I can’t imagine my life any other way. I only wish I had taken that step sooner! Veganuary – Try vegan for a month, stay vegan. 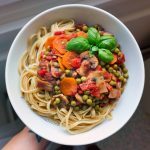 Recipes, product lists, and vegan lifestyle advice. Vegan Starter Kit – A good starting point for vegan-curious individuals. « What’s in my bag? New video edition!